Stewart Filmscreen has announced the death of company president and CEO Grant Stewart, age 60. He passed away on the morning of October 27, 2015, after battling cancer. Grant's wife Mary, who retains ownership of the company, their two children, his father Pat and the entire Stewart family, survive Grant. 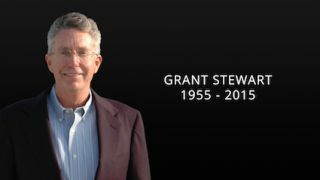 “Grant will be sorely missed by many in both his personal life and the AV industry,” said Don Stewart, Stewart Filmscreen chief technology officer and Grant’s cousin. A third-generation leader of Stewart Filmscreen, Grant was the grandson of Stewart Filmscreen founder Roy Stewart. Under Grant’s leadership, the company developed products such as the Director’s Choice line of screens, the award-winning LuminEsse “edgeless” rigid front projection system, and the value-positioned Cima line. Stewart Filmscreen recently launched a new website designed to make it easier for commercial and residential integrators to specify the right screen for any job. As the company moves forward, Grant’s cousins, Tom and Don Stewart will work closely with Mary to guide the day-to-day operations of Stewart Filmscreen. He added that the company as a whole will honor Grant’s memory and wishes by continuing to build upon the legacy started by Roy and carried on by Grant, and by maintaining Stewart Filmscreen’s position as "an industry leader in projection screen technology." At the time of this release, a public memorial service is not planned. In lieu of flowers and other sentiments, contributions can be made in Grant Stewart’s name to the MD Anderson Cancer Center in Houston, TX, or to the U.S. Biathlon Team, in New Gloucester, ME. Specific information about donation options or other aspects of this announcement can be obtained from Katye (McGregor) Bennett of KMB Communications Inc. by emailing her or calling 425.328.8640.